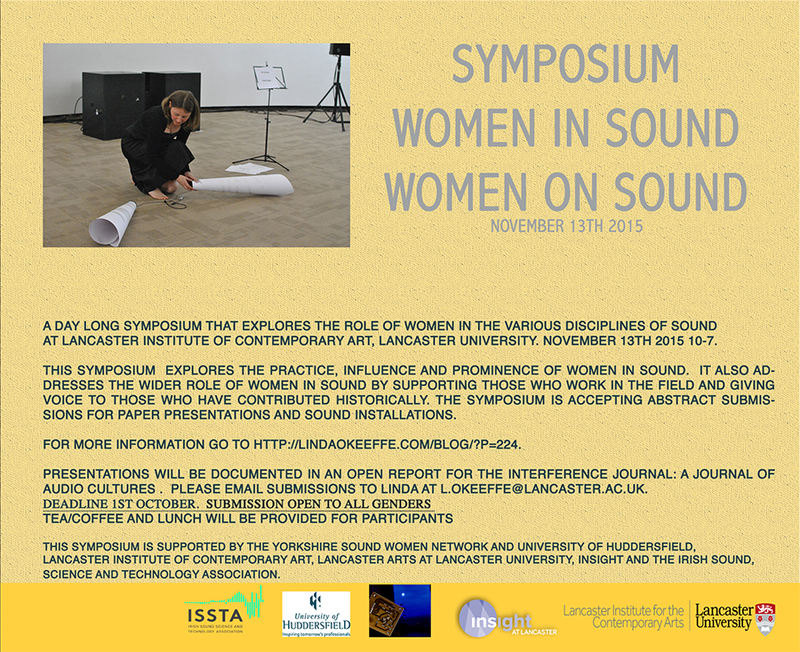 This symposium explores the practice, influence and prominence of women who work in and have contributed to the field of sound studies. The symposium takes place on the 13th of November 2015 from 10-7 at Lancaster Institute of the Contemporary Arts (LICA), Lancaster University. Works presented will include paper presentations and audio installations. Women’s role in sound has largely been excluded from academic texts. The author Douglas Kahn in his seminal work, Noise Water Meat, noted that there have been no ‘fruitful studies of females’ in sound studies, though there exist numerous contributors to various sound disciplines. However, there are now some seminal texts that have been written by women on sound, which have contributed to various fields of sound studies from ecology to music technology and listening practices. These authors include Pauline Oliveros, Andra McCartney, Hildegard Westerkamp, and Emily Thompson, to name a few. There are also publications which have sought to give voice to those working as creative sound practitioners such as the books Her Noise and Pink Noises: Women on Electronic Music and Sound. Nonetheless, what has emerged in recent studies is the increasing lack of women participating in sound events, especially those technologically driven (Oudshoorn and Pinch 2003; Oudshoorn, Rommes, and Stienstra 2004). There is evidence that gender exclusion for various social reasons has played a role in shaping young females participation in sound, music and technology (Armstrong 2011; Born et al. 2014; Cooper 2006; Gauntlett 2008). We hope that this project will have an impact on the wider role of women in sound by supporting those who work in sound and giving voice to those who have contributed historically. Following the symposium the Interference Journal: a journal of audio cultures, will publish a special report on the event. Please submit an abstract of 200 words max for paper and sound submissions. For sound submissions we can accept works for stereo, headphone works and audio video works, please submit 2 min sample of the work (only one submission per person) via a yousendit or web download link such as dropbox. All submissions must be sent to l.okeeffe@lancaster.ac.uk by 12 midday on the 1st of October. You will be notified of acceptance by 7th of October.